Dordrecht, Georg Braun, Frans Hogenberg 1616? Dordrecht Valegio Francesco, 1625 ? Founded in 11th cen. 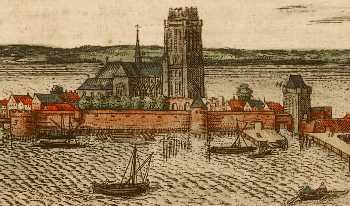 on divergence of Merwede, Noord, Oude Maas & Dordtse Kil rivers; was residence of counts of Holland until 1203; fortified in 1271; severely damaged by flood in 1421 & rebuilt; formerly one of the most important ports in Netherlands.